Lock in a great price for Courtyard by Marriott Bali Seminyak Resort - rated 9.2 by recent guests. Superb Hotel !!! Very comfortable rooms with big size bathrooms. Superb location, very courteous staff, very good breakfast & restaurants. Very interesting shops around the hotel & the hotel is walking distance to the beach. Big size swimming pool. Would most definately recommend this hotel to every one. The buffet breakfast here is crazy, there is literally everything your could ever want. You can order eggs benedict, there is a bagel station, made to order smoothies and even ice cream! 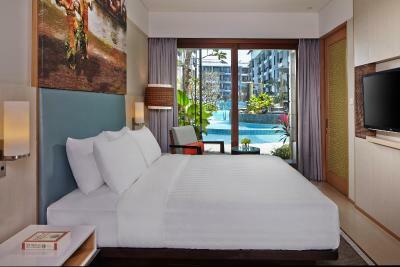 The hotel is located right between the beach and main walking street Seminyak. It has a bunch of nice restaurants and shops. We had the most amazing one hour massage in the hotel spa. The rooms are really modern and the bathroom has a huge shower, best hotel shower i've ever had. Friendly relaxing atmosphere, great staff and exceptionally clean. The staff are amazing always helpful going above and beyond in every situation . The pool bar cocktails and food was unbelievable and the staff were so friendly! The staff are very nice and courteous. The location is quite good since there are a lot of restaurants nearby. The pool is great. Room is very clean and large. Buffet breakfast is fantastic with a wide selection of Western cuisine. Highly recommended! comfy bed and v good choice for breakfast...egg makers very friendly and wanting to please; waiting staff very accommodating . 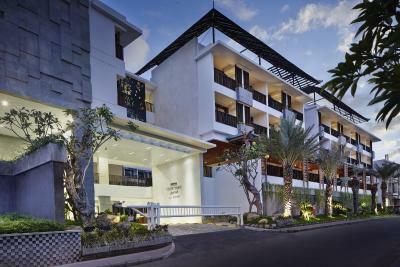 One of our top picks in Seminyak.Courtyard by Marriott Bali Seminyak offers a luxurious retreat 5 minutes' stroll from Seminyak Beach. 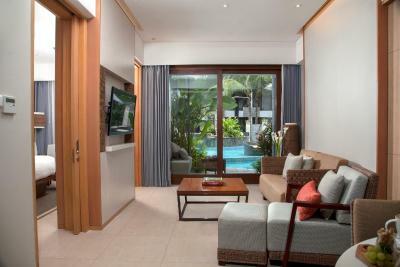 Featuring an outdoor pool, fitness centre and a spa, it provides free scheduled shuttle service to Seminyak Beach. A restaurant is available on site, while WiFi is accessible for free in all areas. 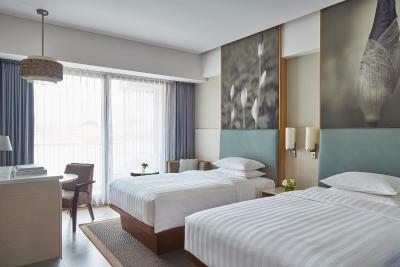 Elegantly appointed with modern interiors, air-conditioned rooms include a flat-screen cable TV, iPod dock and safe. Guests can relax on the private terrace or balcony while enjoying views of the greenery. A minibar and electric kettle are also among the in-room comforts. 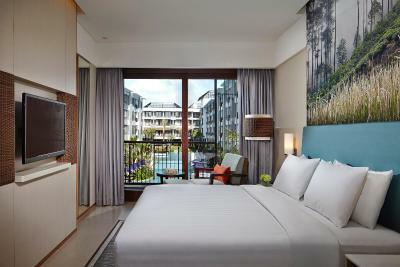 Courtyard by Marriott Bali Seminyak is a 15-minute drive from Seminyak Square and Oberoi Street, while Ngurah Rai International Airport is a 30-minute drive away. Operating a 24-hour front desk, the hotel has luggage storage facilities, and on-site meeting/banquet facilities. Staff can arrange airport transfers, vehicle rentals and babysitting service at additional fees. Laundry service is also offered. 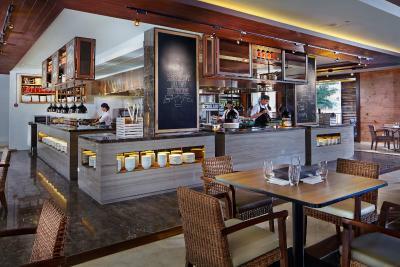 Seminyak Kitchen Restaurant and the pool bar serve a spread of international favourites. Meals can also be enjoyed in the privacy of guestrooms. 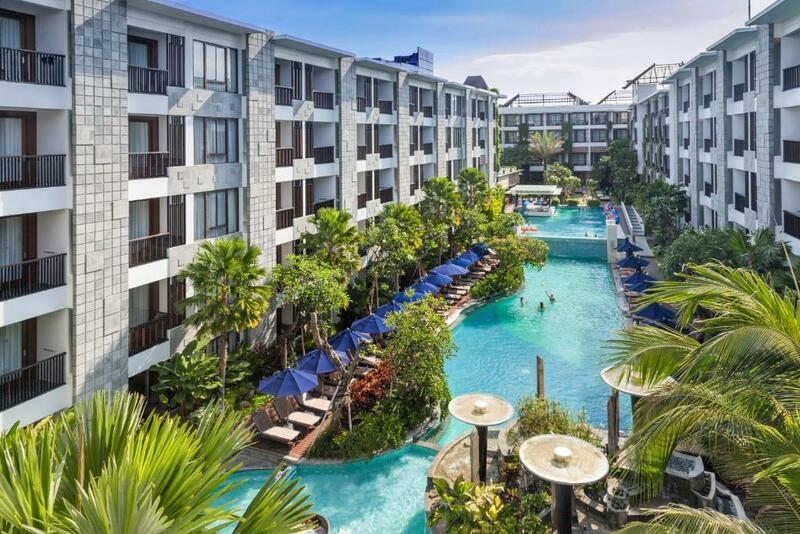 Courtyard by Marriott Bali Seminyak Resort has been welcoming Booking.com guests since 24 Jun 2014. 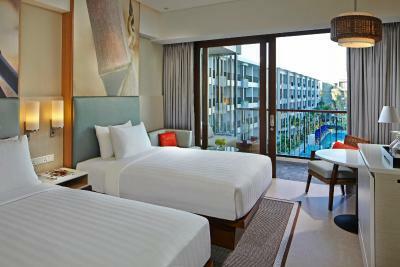 When would you like to stay at Courtyard by Marriott Bali Seminyak Resort? 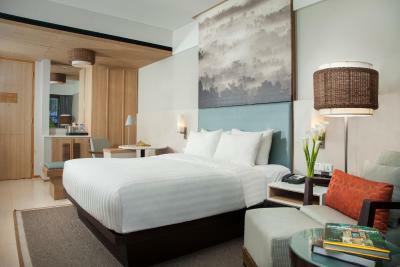 This air-conditioned king room comes with a private balcony. Located on the ground floor, this air-conditioned comes with a direct access to the pool. This spacious suite comes with a living room and a private balcony. This air-conditioned room has a private balcony overlooking the three-tiered expansive pool. Offering direct access to the pool, this suite features its own living room and an en suite bathroom that comes with shower and free toiletries. This expansive suite is fitted with king and twin beds, the room comes with a living room and a dining table while the balcony offers views of the pool. 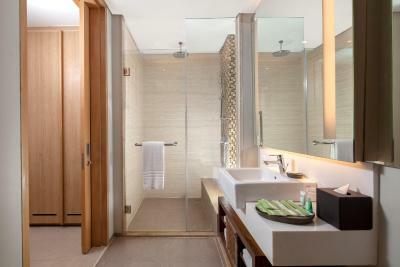 The en suite bathroom is includes a bathtub and shower. 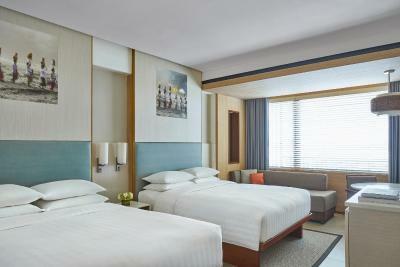 This spacious room features 2 queen beds and a sofa bed. 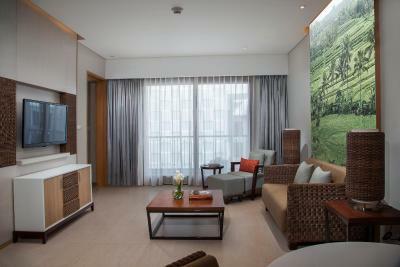 This air-conditioned twin room features a private balcony, sofa and electric kettle. This twin room has a balcony, bathrobe and iPod dock. 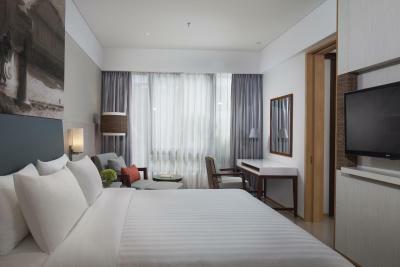 Located on the ground floor, this air-conditioned twin room comes with direct pool access . This family room has a iPod dock, bathrobe and flat-screen TV. 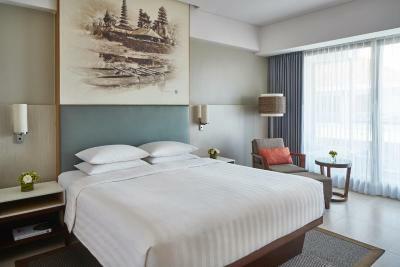 An extraordinary hotel stay awaits you at the 5-star Courtyard by Marriott Bali Seminyak hotel. 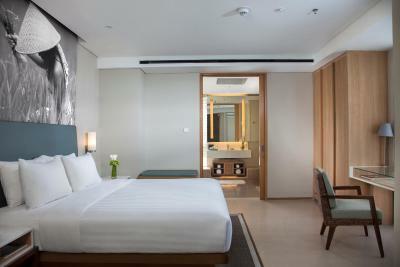 Whether you're in Indonesia for business or to relax, our hotel offers everything you need to make the most of your stay. Our immaculate room and suite accommodations feature amenities like free Wi-Fi and 42-inch flat-screen TVs. 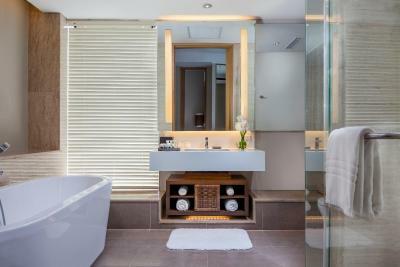 Step onto your private balcony and enjoy views of Seminyak or of the resort pool. 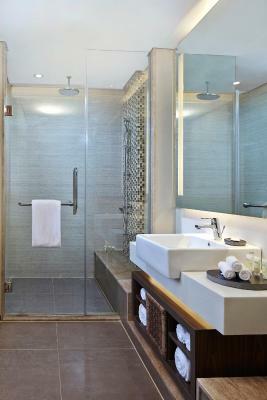 Bathrooms are elegant, with rain showers and 5-star products. 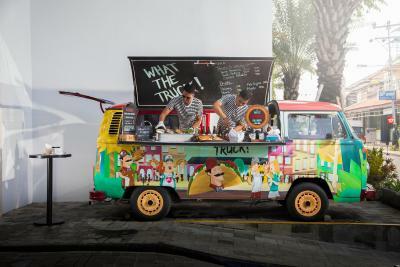 Have a meal at our onsite restaurant, Seminyak Kitchen, or bask in the Bali sun and enjoy a bite by the lagoon pool. Events at our hotel are memorable occasions, thanks to our flexible venue space and modern facilities. And our onsite spa will relax and refresh you. House rules Courtyard by Marriott Bali Seminyak Resort takes special requests - add in the next step! Courtyard by Marriott Bali Seminyak Resort accepts these cards and reserves the right to temporarily hold an amount prior to arrival. 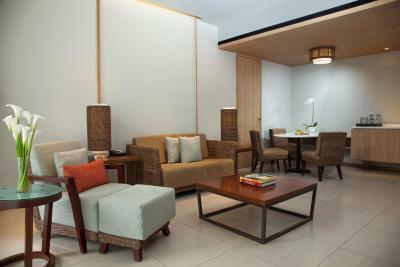 Please inform Courtyard by Marriott Bali Seminyak Resort in advance of your expected arrival time. You can use the Special Requests box when booking, or contact the property directly with the contact details provided in your confirmation. The pool area is quite confined. All the lounges are really close to each other so I didn't find it very peaceful or relaxing. It's quite hard to nab a lounge after the early hours in the morning and one side of the pool is in the shade all day long. My only complaint would be that the price paid through Booking.com was far more (£400) than that had I booked direct via the hotel. I will comment on Trip Advisor regarding this. Hotel modern and very well maintained. Spotlessly clean and staff were so friendly and attentive. Excellent customer service. The breakfast was an amazing experience. -When we arrived the room was full of mosquitos. It took as about an hour to kill most of them. All my family got bitten and when we came back from our vacation my wife was diagnosed with Dengue. I cannot be sure it's from the hotel. But we felt the room should have been checked for something like this. -Personally, I didn't like the Swimmingpool areas, as it felt a bit a bit narrow and constricted with all buildings surrounding it. With only one restaurant the food options got repetitive on a long stay. There’s was t too much to not like about the property , only thing we could fault was the opportunity of not getting a later check out but the hotel was fully booked so that’s understandable. Nothing. Everything is absolutely perfect! Problem checking in as booking.com booked us for 5 hotel said we couldn’t fit five in the room eventually it was agreed the sofa which isn’t officially a sofa bed (I like it’s description on booking.com could be used as a bed for a child. Also currently having building work done affecting some rooms.